Since mid-December commodities are 10% higher with equities about 1% lower. We believe markets have entered a late cycle secular shift into a new regime. Monday the Fed’s preferred inflation gauge (PCE) is expected to hit the central bank’s 2 percent target for the first time in a very long time. Matching or exceeding that forecast would affirm traders’ conviction that inflation is headed higher, pushing up long-term yields. In the last week, we received an XLY (consumer discretionary) vs. XLP (consumer staples) warning in our “21 Lehman Systemic Risk Indicators” model (see below). The recent move is not only unsustainable but also speaks to the increasing probability of recession in the next 12 months. Over the last two years, value (consumer staples) -4% has underperformed growth (consumer discretionary) +29% by nearly 35%. – over the last year, -10% to +14%. After last week’s colossal acceleration, the BEATING is now more than two standard deviations outside the thirty-year mean. Bottom line, the parabolic (see the white line above) outperformance of the consumer discretionary names (ratio of XLY to XLP) has been incredible and is “classic” late cycle activity. The value depression end is in sight in our view. Value will crush growth over the next 12-18 months. A solid leading equity market indicator above, watch for a shift in consumer staples. The sector typically starts to outperform (after a period of blow off top underperformance) 12-18 months ahead of substantial equity market drawdowns and recessions. In all our years on Wall St., one major takeaway is the danger found in “broad theme consensus.” Decade after decade we’ve seen this play out in so many different forms. The more unanimous the sales pitch, when you hear it on every street corner, it’s the best leading indicator to RUN, not walk the other way. Look back to the summer of 2014. Retail investors were lectured, over and over again on the “four irrefutable truths.” MLP companies are 1) toll road businesses, with 2) fixed fees, 3) secure long-term contracts, and 4) the commodity price (oil and gas) doesn’t matter. Of course, ultimately investors learned these truths were more than refutable. Over the next 18 months, the average stock in the MLP sector would lose nearly 70% of its value (see below). MLPs are pass-through entities, which distribute almost all pre-tax income to unitholders, who then are responsible for paying the taxes on it according to their individual situations. As such, they benefit from a very advantageous (almost 0%) tax treatment, while regular “C” corporations pay a 21% statutory tax rate (35% prior to tax reform). Since 2005 MLPs have been able, in the FERC’s words, “to recover an income tax allowance in their cost of service” — effectively boosting the amount of pre-tax income to be passed through. This “double recovery” of income tax costs that MLPs enjoyed is now disallowed. Mark Laskin, from 2013-2017 he was the CIO of T Boone Pickens’ BP Capital Fund Advisors, where he managed Energy and MLP portfolios. The ultimate goal of the Bear Traps report is to discover bear markets transitioning into the new bright bull. Last year we were fortunate to get the solar, oil and steel sector migration north right. This year in the MLPs, we got sucked into a bear trap in January. In error, we chased this group (see the red circle above) into what we believed was a new bull market. We could have stopped ourselves out (stop-loss sell) but our cost basis was manageable from a trading perspective. Today, coming out or the grip of a multi-year grizzly bear market, we believe the MLPs are very close to a major bullish move higher. Over the last few years (see above) we’ve witnessed an incredible amount of capitulation selling. Only when the last retail investor (previous heavy ownership) has given up on the sector can it move higher. The question is, who’s left to sell? Our seven-factor capitulation model quantifies the “fannies rushing to the exits”, and looks back historically in an attempt to measure the selling pain. Is this a category three hurricane, or a more treacherous Cat 5? In November’s first major MLP capitulation, we had an 18% gain from our AMLP entry into the new year (see above). Next, we tried to buy on the trend break (red circle above), thinking this was the great jailhouse break out of the bear’s multi-year grip. Next, we were met with a painful second round of selling last month, and we should have, in all likelihood, lightened our position there. In October, she was trading 9M shares a day, but by the November capitulation, it was 20M a day! They were jumping over the seats, swinging on the chandeliers, trying to get out through the bathroom window, the wild mob wanted OUT of the MLPs. Moving forward to the March capitulation, we had reached 25M shares a day, a true panic yet again! Who’s left to sell the MLPs? The Federal Energy Regulatory Committee (FERC) ruled last month that it will revise its 2005 Policy Statement for Recovery of Income Tax Costs and no longer allow master limited partnership (MLP) interstate natural gas and oil pipelines to recover an income tax allowance in the cost of service rates. The news triggered a dramatic capitulation sell-off (see above) in the MLPs out of fears of a considerable hit to their operating profit. With the recent developments since the FERC rate policy change, the stocks most impacted were those with higher exposure to the cost of servicing pipelines. Given the weakness in EEP and TCP, which are also financing vehicles for C-Corps, we could see difficulties in executing drop downs, a way energy companies monetize the midstream part of their operations. Most of the other MLP names are not as exposed to this recent FERC-related negative impact on the share price, as their drop downs look ok to us. The most impacted pipelines under this ruling are those that have legacy costs of service rates, and those that are earning at their maximum rate. However, the FERC ruling applies only to interstate pipeline assets and not to those that originate and terminate within the same state. Furthermore, the rule is not expected to go into effect until 2020. In cases where the MLP holds the pipeline asset but a C corporation ultimately owns the MLP, the FERC rule applies. In a reverse case, where the C corporation owns the pipeline within an MLP, the asset would not be subject to the ruling. As a result, we could see strategic reviews and acquisitions within the MLP sector to circumvent the income tax order. Examples of these would be refining companies buying back assets currently held in MLPs (see our M&A section above). The ruling does not apply to, for example, Kinder Morgan (KMI), which acquired its MLP some years back. But in the case of Williams Co. (WMB), it might be collaborating with Williams Partners to create a new corporate structure to hold long-haul assets like its Transco gas pipeline. This is a big opportunity that is certainly worth watching. The period of time (between today and the enactment of this tax code restriction), where corporations have the opportunity to buy (and therefore secure) a tax-advantage that they previously saw more value in divesting. They were wrong, and they now have the chance to fix it. Ultimately, only a few MLPs will see a meaningful impact on their earnings from the FERC ruling. On the other hand, we could see strategic reviews leading to some buybacks of MLPs that were spun off in the past. Refiners have spun out their pipeline assets into MLPs in prior years, but may now want to buy them back to circumvent the new ruling. Imagine walking through the park and across the way there’s a seesaw with an obese child on one end and a thin youngster on the other, that’s no fun. It simply doesn’t work. When you think about the $1.5T of capital that’s flown into passive bond ETFs and risk parity strategies in recent years, this crowd has a colossal disinflation bet on. In other words, so much money has flown into bonds at extremely low-interest rates, if yields surge* there’s no protection on the other side. *Forget about a surge, just don’t rally. Interest rates down, bond prices up. If interest rates are unchanged, bond prices will be as well. 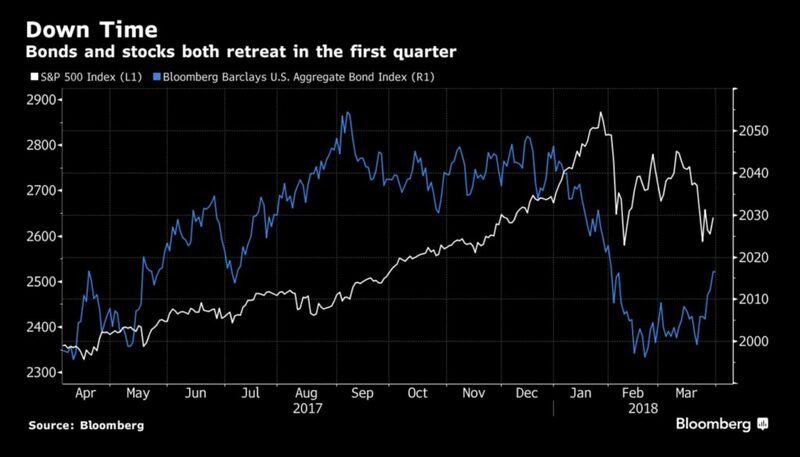 In a regime change, a period where stocks and bonds move lower together, the flight of assets out of passive bond / risk parity strategies will be ferocious. Click here to get a peek at our winners in this new regime. Think of the dentist in Cleveland, Ohio with $1M in stocks and $1M in bonds in a portfolio. For the first time in 30 years, he / she is looking at their brokerage statement and seeing NO wealth destruction OFFSET from bonds. We have an eye on credit quality globally (AAA rated corporates / sovereign credits are off 30-40% in terms of the amount of high-quality paper last 10 years). Next, shift your eyes on the debt to GDP in the G20, up from 70% to near 100% (maybe 110%). Then look at the EM dollar-denominated debt issued 2007-2017, in the trillions, there’s a new player at the table trying to sell / refinance a large debt load. All this speaks to a regime change, we’re in the 1-2 inning we believe, more to come. Even with the bond rally in March, they still finished Q1 in the red with stocks. *Last 10 years, Bloomberg US Market Capitalization data. **only instance in the last 18 years where bonds also lost value. In the 2018 equity drawdown, bond SOLD OFF from 2.05% to 2.85%, ADDING nearly $1.4T of ADDITIONAL wealth destruction.